Sinn Fein leader Gerry Adams has accused the British Direct Ruler Theresa Villiers of an “unacceptable intervention” ahead of talks about dealing with the past as well as the issues of parades and flags. 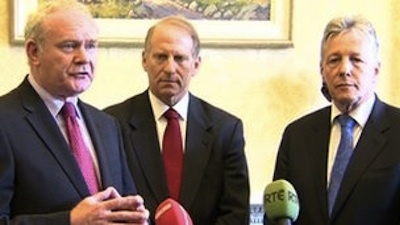 The talks are due to begin on Tuesday, and will be led by US envoy Richard Haass. Mr Adams said Theresa Villiers had been “attempting to set parameters” before the discussions on flags, parades and the past through a speech made in Cambridge at the weekend. In her address, Villiers told a meeting of the British Irish Association that she believed the task facing the multi-party talks group was “immensely difficult”. She also said that the British government would ‘never put those who uphold the law on the same footing as those who seek to destroy it’. Mr Adams said: “She devoted a significant section of her speech to the issue of dealing with the past. “This is one area which will be dealt with in the upcoming Haass talks. The talks have already been hit by sharp exchanges over the unilateral decision of DUP leader Peter Robinson this summer to axe a peace centre on the grounds of the former Long Kesh prison, where ten Irish hunger strikers died. Meanwhile, loyalists have maintained the pressure on the issue of sectarian parades with a planned 10,000 strong march through Belfast this weekend to demand the right to hold parades through Ardoyne in north Belfast and other nationalist areas of the city. There have also been questions over the ‘peace envoy’ credentials of talks mediator Haass, whose strong expressions of support for a US bombing intervention in Syria’s civil war has been described as “bloodthirsty” by peace campaigners. The chairman of the Historic Enquiries Team (HET), a special unit attached to the PSNI police tasked with investigations into past killings, finally agreed to quit his post by the end of this month after coming under immense pressure from families of the victims. The move ends weeks of speculation about Dave Cox’s future after a report published in July suggested the HET had given special treatment to British soldiers accused of killing Irish nationalists. The HET’s director of military operations, Paul Johnston, will also leave on September 28. PSNI chief Matt Baggott had been adamant that Mr Cox should stay until his contract expires at the end of December. But during a heated exchange with Baggott about the future of the beleaguered team on Thursday last week, Policing Board members insisted that Mr Cox should leave at the end of this month. Sinn Fein assembly member Pat Sheehan, a member of the Policing Board, said Mr Cox’s departure should have been rapid because the public was “entitled to see effective policing oversight”. But it is understood Baggott’s handling of the situation had exacerbated tensions between himself and board members, and that the PSNI chief’s own job had been seen to be at risk. Amnesty International this week said victims of the conflict are being “disgracefully let down” by a “flawed and fragmented approach” to dealing with the past. In a new report, Amnesty International said victims and their families “have been failed” by the HET, the Police Ombudsman and other Stormont institutions. It blamed an inadequate patchwork of investigations and criticised a lack of political effort. Its report was launched as the British government controversially ruled out a new inquiry into the 1998 Omagh bombing, a development that was greeted with dismay by Amnesty and other justice organisations. And this Friday, Villiers was forced into a humiliating climbdown on her attempts to suppress public domain documents on state killings. Her officials had sought an injunction to prevent Sinn Fein Minister Caral ni Chuilin, who has responsibility for the North’s Public Records Office, from passing unclassified documents on inquests on the killings to the victims’ families. Sinn Fein representative Rosie McCorley welcomed the news that the injunction had been dropped. She said the Minister’s actions had been vindicated and the British action had only served to “add more grief to the familie”.